I am sort of tuned into Headline bias. When I see something like "SUV Kills Pedestrian" or "Handgun Kills Child" it drives me nuts.There have been a number of recent stories in the local media about "Pitbull Attacks". It seems that any dog incident involving a Pitbull is automatically worthy of a headline. This concerns me greatly because it leads to a negative view of the breed. So many communities have passed or are considering passing breed specific legislation and this sort of "Journalism" just encourages that thinking.I've written several letters to the Reporters, but they have indicated that they find these "Dog Bites Man" stories to be newsworthy.One reporter admitted to me that a consideration of printing stories like this was driven by the fact that it occurred, in his own words: "in a community that is known for being one of the safest in Metro Detroit"So this admitted bias towards stories that are provocative is only doing additional harm to a breed of dog that has been the target of negative bias for years.Not really sure what my point is here, I guess I'm just frustrated in media headline bias and don't know what else to do. There was madness in any direction, at any hour…You could strike sparks anywhere. There was a fantastic universal sense that whatever we were doing was right, that we were winning…. And that, I think, was the handle-that sense of inevitable victory over the forces of Old and Evil. Not in any mean or military sense; we didn’t need that. Our energy would simply prevail. There was no point in fighting-on our side or theirs. We had all the momentum; we were riding the crest of a high and beautiful wave….So now, less than five years later, you can go up on a steep hill in Las Vegas and look West, and with the right kind of eyes you can almost see the high-water mark-that place where the wave finally broke and rolled back. Child Killed in Auto Accident Child Killed By Father Cleaning Gun, or whomever killed himDog Bites Man, which isn't even news since according to the CDC it happens over 4.5 million times a year in America.When the terms SUV, Handgun, or Pit Bull are used in the headlines it is not to provide additional details, it is to provoke an emotional reaction to get people to read the story. This is borderline demagoguery. I agree, a dog bite is not news. Unless a human is mauled, like that lady a few years ago in the apartment building, there is no reason to report it.I agree that columnists and television media are out of control putting their spin on the news they cover. Yestreday on Yahoo there was an article on Cancer Drugs and costing 93K a year to keep a man alive for another 4 months. They asked him if he'd pay and he said no, he did it because insurance paid for it. Then the next part was basically talking about the government rationing care and how its a necessity.http://www.huffingto...t_n_739722.htmlI am sure this article will give Henry a coronary. You'd probably get more sympathy for this position if bit bulls weren't vicious beasts. Parakeet nips owners finger, blood is drawn.You wouldn't read that? You'd probably get more sympathy for this position if bit bulls weren't vicious blood thirsty beasts. Also depends on what pictures you use.This One Or This One Which might lead to this one. pitbulls are in a special class re: aggression, bite risk. my firm just flat refused to insure anyone who had a pitbull or german shepherd, for instance. it's not that the breed can't be loving and all the rest, it's more the fact that a negligent owner can produce a VERY dangerous animal.all of this has been said before, though. First, "pit bull" isn't a real breed, it's a subset of mutts that are treated cruelly until they become vicious.The breed usually called a pit bull is the American Staffordshire Terrier, and, like any breed, if they come from a good breeder, they are wonderful.Bad owners can make any breed vicious. Also, people who want dogs that are vicious like mutts that look vicious, and so relatives of the AmStaf are popular. There is only one dog that has no legitimate reason to exist, the cane corso, which was bred specifically to have a strong instinct to kill humans. This is the breed that mauled the woman in San Francisco. Fortunately, there are very few of these, but I could support banning them. http://www.huffingto...t_n_739722.htmlI am sure this article will give Henry a coronary. Yeah but the research shows that a disproportionate amount of deaths and bites come from pit bulls. A CDC study found that over a 24-year period about 1/3 of all dog-related deaths were from "pit bulls." 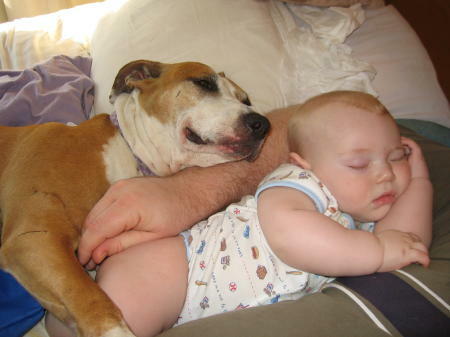 Pit bulls and rottweilers together account for the majority of fatalities. I don't think there were any poodle-related fatalities in the same time period. All this tells you is that people who make their dogs vicious should not be allowed to own dogs. "100% of all crimes were committed by humans. Therefore, we should preemptively jail all humans." Who will stop all the pit bulls then?You don't always think these things through do you? All this tells you is that people who make their dogs vicious should not be allowed to own dogs. who cares about dogs when there are retards driving around in SUVs trying to kill everything in their way. why the hell does somebody who lives in an urban area need an SUV if it isnt to try and mow me down when i just want to ride my bike?